Our friendly staff will help you find the perfect island excursion for you and your family. 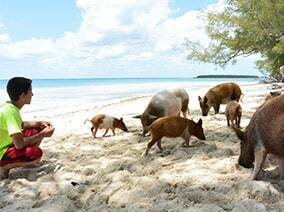 There are an array of things to choose from like beach picnics, sunset cruises, day trip to nippers, turtle encounters, feeding the swimming pigs, snorkel and dive trips, and endless fishing. We have the best guides that will make your out island trip incredible. 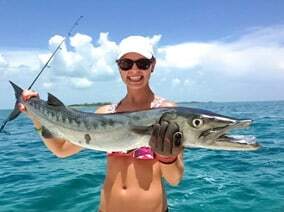 Bahamas fishing is the perfect activity to enhance your Bahamas vacation. Fishing in the Bahamas offers a variety of fishing for all levels of anglers. Bonefishing in the Bahamas is a very popular sport and anglers can book through The Green Turtle Club a Bahamas flyfishing guide. The flats around our Cays are plentiful with bonefish for fly fishermen and spin casters looking for a challenge and our bone fishing guides have experience to help you catch the big one! The flats of Green Turtle Cay are home to the elusive bonefish. 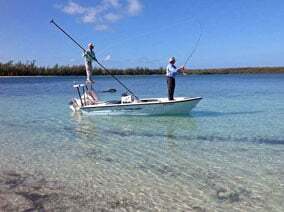 Abaco has become renowned for large bonefish with fish of 9 to 12 pounds a common occurrence. A world record bonefish, 17 lb 2 oz., was caught in Abaco in 1999 by visiting fisherman Lazaros Vostitsanos of Tarpon Springs, Florida using 8 lb line and light spinning tackle. 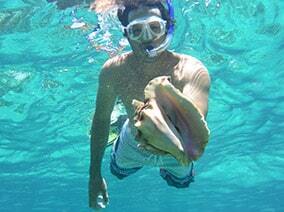 A wide variety of options are offered to anglers visiting Green Turtle Cay. The offshore fishing of Abaco attracts many of the top billfish anglers from North America as big game fishing for billfish can be found just a few miles off shore. Dolphin, wahoo, tuna, and swordfish are abundant in the deep waters just beyond the reefs. The deep waters of the Atlantic near Abaco are home to prized big game fish. A 1035 pound blue marlin was caught in 1998 in one of the many Abaco tournaments held annually each spring. It is easy to see why The Bahamas has produced over 50 record catches! Green Turtle Cay is home to more than just bonefishing and game fishing. 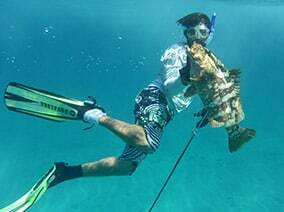 Our ocean reefs attract a variety of fish and fishermen alike. Our reefs are just offshore so even those not-so-experienced seafarers can enjoy a day of fishing on the reef. Anglers at all levels will enjoy catching a variety of fish such as grouper, snapper, mackerel, trigger fish, permit, amberjack and even barracuda. Local fishing guides are available to personalize all your fishing needs. It is highly recommended that reservations be made prior to your arrival at The Green Turtle Club. Ronnie is a bonefish guide on Green Turtle Cay Abaco Bahamas. Ronnie has been featured in numerous fishing magazines and was the subject of a half hour show on ESPN2’s television series George Poveromo’s World of Saltwater Fishing. For reservations, call toll free from the US 1-877-459-9108; from The Bahamas call 242-357-6667 (cell) or 242-365-4070. For more information on Ronnie Sawyer, click here. 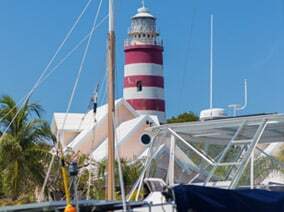 Captain Rick Sawyer is an island born Bahamian who knows the bonefish flats around Green Turtle Cay, Abaco, Bahamas and neighboring cays. He is a licensed and IGFA certified captain and guide with over 25 years experience. Bonefishing and offshore fishing charters are available. For reservations, call 242-365-4261. For more information on Rick Sawyer, click here. Eddie Bodie offers fishing and beach picnics. For reservations, call 242-365-4069. Lincoln Jones offers fishing, snorkeling and beach party cook-outs. Lincoln and his reef parties have been known to visitors and natives on Green Turtle Cay for over a decade. For reservations, contact Lincoln directly at 242-365-4223. For more information on Lincoln Jones adventures. 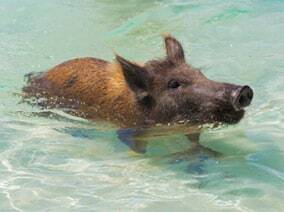 Nippers is located on Guana Cay where they are famous for their Sunday Funday celebration and wild boar pig roast. Don’t want to navigate yourself? Enjoy as many Nippers Rum Punch as you’d like while experienced captains on these two fun party boats get you there and back home to Green Turtle Cay safely. Migratory species such as Wahoo, Kingfish, Tuna or Dolphin shall NOT exceed (18) fish (previously six) aboard the vessel at any one time. 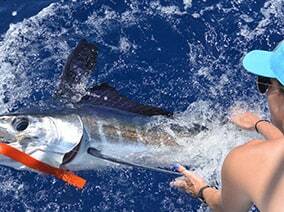 Billfish species (marlin, sailfish or swordfish) caught shall be released unharmed except where landed under the terms of an approved sportfishing event or tournament. Please refer to fishing.bahamas.com for further information.